Is this the biggest Peeps bunny ever? 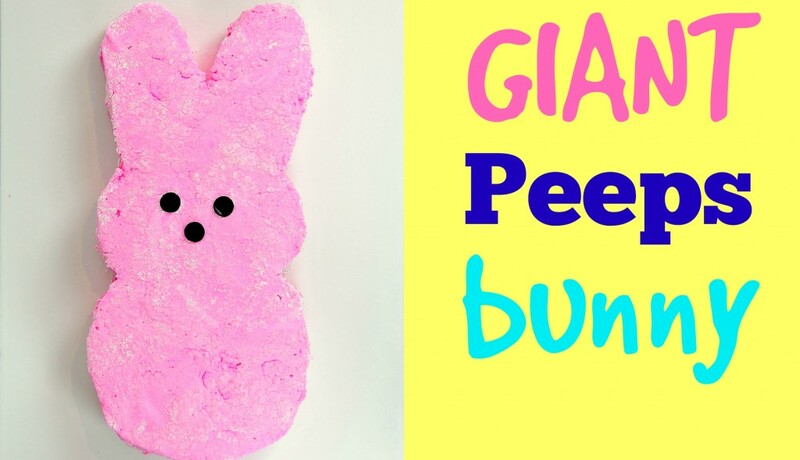 Giant ‘Peeps” Bunny! Isn’t this the coolest Easter treat ever? A giant marshmallow of bunny-ness. This was so fun to make. Spray cooking oil in a 10 inch (25cm) square cake tin. Dust with icing/ powdered sugar. In a medium bowl of an electric mixer beat egg whites until they just hold stiff peaks. Scrape into another bowl to reserve for later. In a fresh bowl of a standing electric mixer pour 1/2 cup of water. Into that, sprinkle gelatin and let stand for approx 5-7 minutes. In a medium heavy saucepan mix sugar, second 1/2 cup of cold water, light corn syrup and salt over low heat. Stir with a wooden spoon until sugar is dissolved. Add flavor oils and pink food coloring. Increase the heat to medium high, and boil, without stirring until it reaches 115°F / 240°F, about 10 minutes. Pour sugar mixture over gelatin. Begin mixing at medium speed, and then increase to high, beating until it more than doubles in size, and looks thick. It should pour slowly from the beaters at this stage. Remove from mixer, and gently fold in the egg whites, until just combined. Pour mixture into cake tin. Sift confectioners sugar over the marshmallow until it is evenly coated. Cover with plastic wrap, and refrigerate for 4-12 hours. Remove from the fridge and gently pull the marshmallow up from the cake tin on all sides and edges. Gently life the marshmallow from the tin, and place on a cutting board. Lightly sprinkle the marshmallow with icing sugar to coat and make it easier to work with. Taking a long sharp knife, cut the marshmallow into quarters, and then into 9 pieces. Take a bowl with sifted icing (powdered) sugar, and roll the marshmallows in it.